The last time the Orioles clinched the A.L. East title at home was way back on September 22, 1979. I remember because I was there. The “magic number” countdown, so rarely seen in these parts of late, had been on for most of September, with the Milwaukee Brewers being the elimination target that year. As a weekend series at home against the Cleveland Indians started, hopes were high that the Orioles would be able to wrap up their first division championship in five years. As Friday began, the magic number was two, meaning that if the Orioles won and the Brewers lost, the O’s would have clinched. I had tickets for Saturday’s game, so this possibility was not as exciting for me. I wanted to see it live, not on the 11 0’clock news. Dreams of a tumultuous on-field celebration that Friday were washed away, however, as the Orioles were rained out and the game was rescheduled as part of a Sunday doubleheader. As it turns out, the Brewers lost at home to the Twins, and the magic number was thus reduced to one. Now, for the “rushing onto the field” fantasy to play out, the Orioles would not only have to beat the Indians, but do it before the game in Milwaukee was finished, in case the Brewers lost again. But at least now I had a shot to see it. Saturday’s weather turned out to be not much better than Friday’s had been, with spotty showers throughout the day. I arrived at Memorial Stadium hopeful of an on-time start, but upon entering the seating bowl, all there was to behold was the brilliant shine of the stadium lights reflecting off the wet tarp. My seat was under cover in lower reserved, behind the Orioles’ third-base dugout. I sat down to wait it out. Milwaukee, being in Central Time, was an hour behind Baltimore, so perhaps the fantasy clinching celebration still could be delivered. Milwaukee might even win. And the rain delay dragged on. In 1979, there was no real-time scoreboard for fans to follow, no “live look ins” to watch. 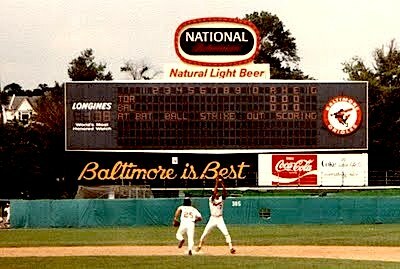 The scoreboard, which in 1979 was just a rectangular array of light bulbs that, when lit in certain combinations, made letters, words and sentences, simply read: “THE BALTIMORE ORIOLES AND CLEVELAND INDIANS WELCOME YOU TO MEMORIAL STADIUM.” As we sat there, chilly, damp and miserable, no attempt was made to keep us informed of the doings in Milwaukee. Were the Brewers winning? Losing? No one seemed to know. And so we all sat there, listening to the distorted echoes of pop music through the stadium sound system, watching the rain drip down from the upper deck above us. I’m not sure how long we waited, but I know that gradually the light of daytime disappeared in the overcast, and it seemed dark for what was actually early evening. And then, suddenly, the scoreboard went black. It was a moment of joy, of victory, of my team returning to its rightful place among baseball’s best, but also, I have to admit, I still felt a bit cheated by the Brewers’ loss, and the uncooperative weather. Many of the Orioles players emerged from the dugout and briefly waved, to the rapturous cheers of the dampened crowd. Then they returned to their place of refuge and the rain delay went on. Ultimately, the game would be played and the Orioles would lose to Cleveland 7-3. As an adult, it later occurred to me that the team was probably following the reports from Milwaukee all along, and had likely engaged in a bit of private celebrating before having to play that evening. As a fifteen year-old fan, it just seemed like a bad game, especially after such a long wait. But it was fine, even then, because I was there when the Orioles clinched a division, anticlimactic though it may have been. This time, however, with the Orioles playing their elimination target, there’s a better chance for the on-field celebration I was cheated out of in 1979. And unlike 1979, home games are televised, so there’s always that.